Privately sited at the end of a quiet cul-de-sac, inside the premier St. Thomas golf community of Mahogany Run, and nestled amidst tiered, landscaped stone terraces, this villa exudes a tranquil tropical ambiance. A covered, finely detailed, gracious entry to this pristine four bedroom, three and a half bath villa, informs the visitor of the exceptional finishes found within. 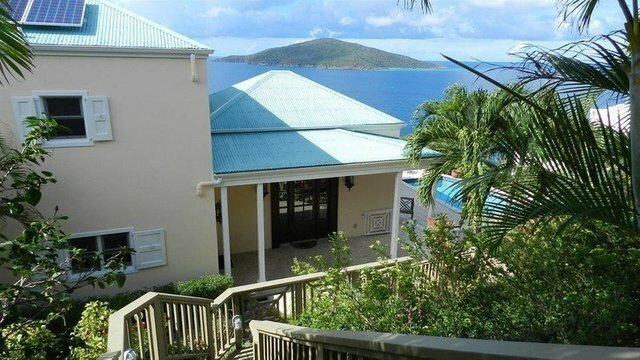 Entry is into a bright and spacious great room, which boasts sweeping out island and ocean views. The beautifully tiled sundeck with pool, are steps outside. Generous covered patios run along the entire main floor, capturing trade winds and adding significant living area to the interior spaces. The open floor plan flows from great room into the wrap around granite, gourmet inspired kitchen with center island. Adjacent, the formal dining area complements the elegant and bright tones of the living areas. The roomy Master Bedroom suite, is on the main floor, and sumptuously appointed through out. Three luxurious guest bedrooms privately located on second level enjoy ocean panoramas. Conveniently located mid island, world renowned Magens beach is minutes away, as is world class fishing, sailing and diving. Direct flights from US East coast assure quick access.